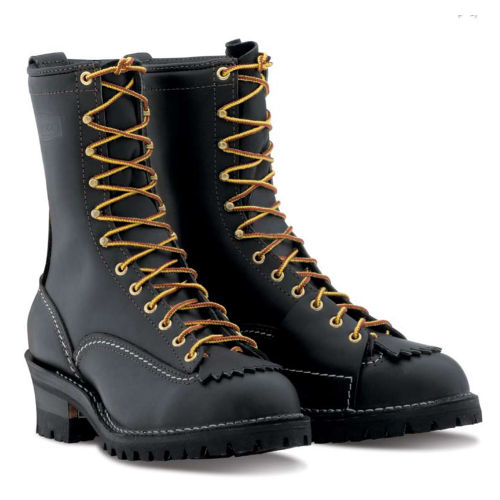 The Wesco 10" Highliner boots in black are the ideal choice for the climbing enthusiast in all of us. These beautiful, leather Wescos, made in the USA, come with a 100 Vibram lug sole, which will steady your step whether you are traversing hills out in the wilderness or the hills of the big city. These lace-to-toe, working boots are made of 7oz full-grain leather, which means you know they will never give out under stress. Workers the world over depend on these boots: linemen, woodsmen, mechanics, and many others. These hardworking people stand by Wesco as a proud and dependable manufacturer of high quality boots. For climbing, these boots contain a non-corrosive, ribbed, slightly arched steel shank. Shanks give your feet support as you climb and help bear the load of your weight during ascents. This means mountaineers will no longer be rubbing their feet in pain at the end of a treacherous ascent. In addition to this, the Wesco Highliner also comes with a leather half-slip for even more added support for your arches. These boots were made to preserve your feet. Highliners don't only help mountaineers though! These boots are also ideal for those of you who need general working boots that will stand the test of time; these boots will surely not disappoint! Check out our Brown Highliners if you are looking for the same boot in brown!